This year's event increased participation for the third straight year. Were it not for several other players having success in earlier events that carried them forward toward those event finals, we would have had 28 contestants in all probability. As in years past the tournament featured all the games in GMT's American Revolutionary War Series with Saratoga available as the default game in every round of play. This year's format differed from previous tournaments in two ways. Sides were determined by bidding Army Morale Points rather than Victory Points and the first round of play was Swiss Elimination. All players were guaranteed three games; win, lose or draw. The top eight players, determined by a point system, advanced to the second round of single elimination. The first game in the Swiss round was Eutaw Springs. Play balance could not have been better. There were four British wins (two substantial and two marginal). There were five American wins (two substantial and three marginal). There was also one draw fought between Jim Mehl and Bill Riggs. In addition there was a Saratoga default game played between Frank Hastings and Tom Wisner in which Tom's British won a substantial victory. Eighteen players continued into the second Swiss round that featured Guilford Courthouse. In this round the British won five games (one substantial and four marginal) while the Americans won three games, all by marginal victory. Tournament rules stated that in Guilford a draw would be scored as an American marginal victory and that occurred once, between Paul Barker's Americans and Chuck Frascati's British. 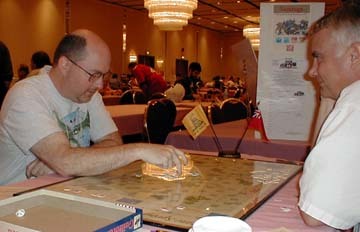 There was also one Saratoga default game played in this round in which Bill Riggs' British won a substantial victory over Mathew Burkins' Americans. The third and final Swiss round was the "Knyphausen's Feint" scenario from Brandywine Creek. Twelve players continued the contest in this heat. The British side cleaned house garnering five wins (three substantial and two marginal). Only Frank Hastings' Americans prevailed over Mike Nagel's British earning the first decisive victory of the day. The eight quarter finalists entered the single elimination round seeded by points as follows: Luke Warren (+8), Tom Wisner (+7, Army Morale Point differential +37), Mark Miklos (+7, Army Morale Point differential +33), Paul Barker (+7, Army Morale Point differential +23), John Vasilakos (+5, Army Morale Point differential +23), Frank Hastings (+5, Army Morale Point differential -10), Mike Nagel (+3, Army Morale Point differential +10) and Bill Riggs (+3, Army Morale Point differential -12). The first round of single elimination again featured Eutaw Springs. This time the Americans won three substantial victories. Only the British commanded by John Vasilakos prevailed with a substantial victory over Paul Barker's Americans. Paul, incidentally, is from Great Britain and the first international competitor to play in the Saratoga tournament since it began at the WBC in 1999. It was a real pleasure having him with us. Four semi-finalists emerged: Luke Warren, Mike Nagel, Mark Miklos and John Vasilakos. Unfortunately Mike had to withdraw because of commitments in another event and we were sorry indeed to see him go. This meant that John Vasilakos, as the most recent past champion (2002), drew a bye while Mark Miklos squared off with Luke Warren in a semi-final of Saratoga. In the end Miklos' British won a marginal victory. Thus the stage was set for a final that reprised last year's. Miklos took the Americans at Saratoga against Vasilakos who commanded the King's troops. These two commanded the same sides at Brandywine Creek in 2002. This year's outcome, however, was a reversal of fortune as the Americans won a close and hard fought marginal victory. In the early turns Miklos attempted to turn the British right at Freeman's Farm. The gesture failed completely and the British pressed their advantage for several turns getting out to an early lead in points. The Americans were only able to stave off disaster by the good fortune of a double move that allowed Miklos to disengage and re-form a line behind the Middle Branch. The middle turns saw both sides deftly maneuver seeking any advantage. It fell to the Americans who were able to strike the British left in full measure. They first reduced a German regiment with rifle fire, killing von Riedesel in the process, and then gave the coup d' grace with close combat that eliminated the unit. Simultaneously, Gates released by die roll (turn 9) and poured reinforcements forward. The final turns were a foot race for the British baggage train on the Hudson River. Gates advanced up the River Road while Arnold, leading Morgan's rifles, Dearborn's light infantry, and several line regiments from New Hampshire and Massachusetts, went cross-lots through the forest. American units successfully interdicted some of the forest paths forcing the British to take the long way around, thus slowing their progress. The last turn and a half were a battle for the baggage camp. In the end, Arnold successfully took the hex but could not push all the adjacent British units away, thus failing to achieve a decisive victory. The game ended with British Army Morale wavering but not demoralized. Miklos, Gates, Arnold and the Americans won by marginal victory, 7 to 5. The Republic was saved and Miklos and Vasilakos have next year's "rubber match" to look forward to.